Do you give sweets to your ‘sweetie’ on Valentine’s Day? According to the National Confectioners Association, 83% of Americans will give chocolate or candy on Valentine’s Day. Valentine’s Day is the third largest holiday for the consumption of chocolate, trailing behind Christmas and Easter (US Food Market Outlook 2018). 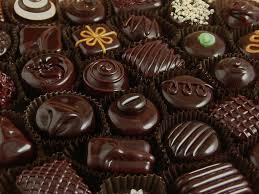 58 million pounds of chocolate will be purchased the week before Valentine’s Day. That’s a lot of extra calories, fat and sugar. My son’s birthday happens to be on Valentine’s Day. Knowing there would be an abundance of sugar at classroom Valentine parties we have always tried to bring a healthy treat to share for his birthday. Pictured here is one of my favorite birthday treats we have shared with classmates. It’s simply fruit cut into heart shapes and arranged in a heart-shaped pan. And you know what? The class has always devoured the fruit! Consider sending a healthy treat for your child’s classroom… fruit, pretzels, raisins… or a non-food item like pencils or stickers. Flowers – buy local and save money! Of course you can still enjoy a little chocolate… just do so in moderation and balance it with physical activity and smart food choices the rest of the week. Feel free to share your favorite healthy gift idea in the comments below. One of the lesser-known benefits of consuming a diet high in polyphenols is its beneficial impact on your gut bacteria. Polyphenols are natural compounds found in plant foods such as fruits, vegetables, coffee, tea, and wine. They provide amazing health benefits as they proceed through the digestive tract. The majority of polyphenol compounds stay present all the way down to the colon where they are then broken down by your gut bacteria into metabolites. Polyphenol-rich foods provide nutritional assistance that helps protect the health and welfare of your gut microbiome. They should be included in your diet along with such heavy hitters as probiotics and prebiotics. Your body contains approximately 10 trillion human cells, but over 100 trillion “good” bacteria. They outnumber you 10:1, so you need to protect and support them with your food choices. They can be negatively affected by antibiotics, stress, and poor food choices (fast food, processed food). Polyphenols provide the same type of benefits as prebiotics, meaning that they increase the amount of healthy bacteria in the gut. I am a 365 day/year iced tea drinker, and wanted to see if drinking black tea would provide a more beneficial effect on gut bacteria than green tea because it is fermented, whereas green tea is not. Tea is one of the most researched of all the high-polyphenol foods, with many studies showing a positive link between the prebiotic effects of tea leaves and their polyphenol composition. What is exciting is that not only do polyphenols increase the number of beneficial bacteria, they also inhibit the growth of potentially pathogenic bacteria. Catechin, a polyphenol found in tea, chocolate, apples, and blackberries, has been shown to significantly inhibit the proliferation of pathogens such as Clostridium histolyticum, Staphylococcus, and Salmonella. Studies also show that tea consumption helps repress the growth of Clostridium perfringens, Clostridium difficile, and Bacteroides spp. Eating polyphenol-rich foods on a regular basis, along with probiotics, prebiotics, and resistant starch will balance your microbiome and help you achieve good gut health! Below is a list of some of the most polyphenol-rich foods, ranked from highest in polyphenols to lowest (per serving). Chocolate – Good or Bad? Tis the season for chocolate. Most of us love chocolate anytime of the year but from Halloween to Valentine’s Day, chocolate seems to be all around us. Is dark chocolate really good for you? Do the flavanols in chocolate really help you? Chocolate or cocoa powder does have flavanols. The cocoa bean is a rich source of flavanols which are a group of phytochemicals in food. However, depending on how the cocoa bean is processed many flavanols can be lost. Flavanols tend to be bitter tasting, so manufacturers roast, ferment, pulverize, and sometimes alkalinize the cocoa bean to improve taste. Thus, it is hard to know how much benefit is in that chocolate piece. • Consuming a large amount of cocoa flavanols has produced benefits including improved endothelial function (dilation of the artery). This helps blood flow through the arteries and may help reduce risk of cardiovascular disease. • Some promises of lowering blood pressure and improving brain function have been seen with consuming large amounts of chocolate. • Sorry, but chocolate does not help you lose weight. Studies show the more chocolate you eat the more weight you gain. So, how do you get the benefits of the cocoa bean without gaining a lot of weight? Using or eating cocoa powder is your best source. Two tablespoons of unsweetened cocoa powder will provide you with 200 mg of flavanols and about 20 calories. You could try adding it to your coffee, warm milk, oatmeal or yogurt. That is unsweetened, so if you add sweetener the calorie content will jump. To get 200 mg of flavanols you can choose baking chocolate (unsweetened) providing about 70 calories; 1-1/2 ounces of semi-sweet chocolate chips providing 200 calories or 2 ounces of dark chocolate (at least 65%) with 320 calories. 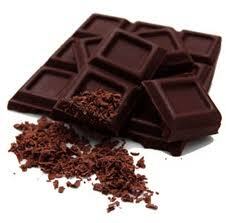 Forget milk chocolate, white chocolate and chocolate syrup as they have few flavanols and lots of calories. Enjoy chocolate in moderation, yes benefits, but also calories. Schardt, D. . How bittersweet it is, Nutrition Action HealthLetter, December 2013. 40(10). 8-11.